The year 2012 is about to end now with a cold month of December yawing to commence a few days from hence. And already, analysts and eagle eyed media scrutineers have started to point tout failures and hiccups that the social media faced during the year. In 2012, plenty of big brands and organizations suffered serious backlashes on social networks like Twitter and Facebook for offensive tweets, questionable ad campaigns or controversial company statements. Some, like McDonald’s, attempted good-natured social media campaigns that simply took unexpected turns. 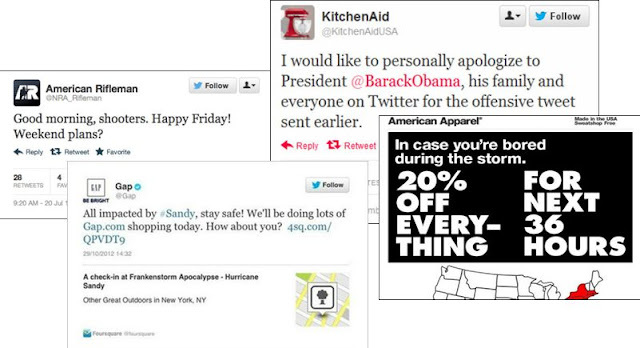 Others, like StubHub’s and KitchenAid’s Twitter accounts mistakenly send out shocking tweets. Mashable has summarized 11 of 'most memorable' these social media mistakes of the year 2012, which as I said earlier is almost over, but for the month of December.